If you are looking for information on the Unique Blends Juice Bar franchise business opportunity, Unique Blends Juice Bar franchises or Unique Blends Juice Bar franchising, then you have come to the right place. The Nation's Health One Drink At A Time! 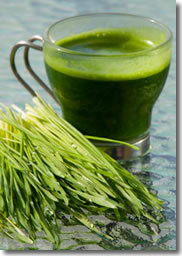 Are You Interested In Taking Part In A Revolution In The Smoothie Industry? Unique Blends Juice BarSM is the first concept of its kinds to offer a much needed update to the $2 billion smoothie industry. With a focus on educating consumers to the benefits of using the right ingredients to combat the growing health and obesity issues in our country, Unique Blends is positioned to revolutionize the industry. At Unique Blends, we pioneered the use of organic and natural ingredients to develop a collection of great tasting drinks and smoothies that offer unsurpassed nutrition and taste. Our Certified Nutritionists developed cutting-edge drinks and smoothies to meet specific criteria for ingredient quality, nutritional content and taste. Our products also meet the demand from many consumers today for a quick snack or meal replacement that is healthy and truly nutritious. Most other similar concepts offer herbal "extras" or vitamin add-ons to their drinks simply to charge customers more money. Nutritional science has proven that one-time use of most supplements is ineffective at providing any noticeable benefit. That is why Unique Blends drinks are naturally loaded with vitamins, minerals, and antioxidants - no additional (artificial) additives are needed! If you are interested in operating a successful, profitable business that positively impacts the health of your customers, we invite you to consider a Unique Blends Juice BarSM franchise. We offer two store options - a Unique Blends inline store is located in food courts, airports and other similar venues and can be operated in as little as 300 square feet. A Unique Blends retail store is operated from strip malls and free-standing buildings and requires 800 to 1,500 square feet of space. With a modern, ultra-chic design and a décor that emphasizes the science behind our products, Unique Blends Juice BarSM stands out from all other similar concepts. 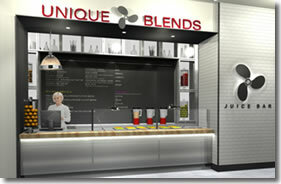 Decreased costs in opening your Unique Blends Juice BarSM store when compared to other concepts in our industry. Our experienced team help you construct, equip and outfit your store without breaking the bank. It is important to note that we do not earn any revenue or rebates from your purchases of equipment, fixture, furnishings or any other item related to your store build-out. Project management support from site selection to build-out to opening. Having worked with many national and international concepts, our expert support team helps ensure that your Unique Blends Juice BarSM franchise opens at the right location, on time and on budget. Proven operational systems and procedures that make operating your store an enjoyable and rewarding experience. Proprietary recipes designed by our Certified Nutritionists that positively impact your customers ... and keep them coming back for more! 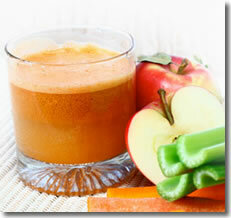 Extensive franchise training covering every aspect of the Unique Blends Juice BarSM business. Onsite support provided during your grand opening period. A comprehensive Operations and Policies Manual that will help you manage your Unique Blends Juice BarSM franchise efficiently and profitably. Approved sources of supply that meet the highest standards for quality and taste. Advertising and marketing programs that attract customers to your location. A corporate support team that is 100% dedicated to your success.